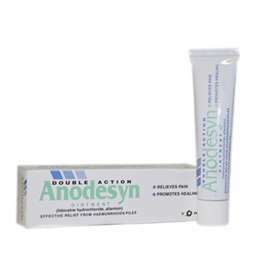 Double Action Anodesyn Ointment 25g with Lidocaine Hydrochloride and Allantion for symptomatic relief from external haemorrhoids/piles. Anodesyn ointment contains lidocaine, a local anaesthetic, to relieve pain and soothe itching. The allantoin helps to promote healing in the affected area. Wash the affected area with tepid water and then dry. Apply the ointment with gauze or lint. Repeat as necessary, do not use for longer than 7 days unless advised by your doctor. Not recommended for children under 12 years old. Seek advice from your doctor before use if pregnant or breast feeding as lidocaine can be absorbed into the body and passed on through breast milk. Lidocaine Hydrochloride pH eUR 0.5% W/W, Allantoin BPC 1934 0.5% W/W. Also contains; White Soft Paraffin, Wool Fat, Purified Water.